Our membership is growing steadily and we already have many members spread over a wide geographical area. There are a group of us who always travel to games together & on occasions we have spare places to fill. We attend every Home game and most Away games. Our travel group is mostly made up of people from the Derbyshire / Nottinghamshire / Staffordshire areas. Lifts to games can be requested by e-mail directly to our chairman using the link below. 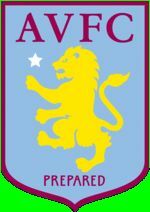 We have a regular venue for home games which is approximately a 10 min walk from Villa Park. Season long membership passes are available to purchase for a very reasonable cost & children are welcome as long as they are accompanied by an adult. All members new & old are always made very welcome. Along with 2 bars serving a decent range of beers, there are reasonably priced bar snacks, selection of filled rolls, a beer garden with large covered area with a kiosk serving a range of tasty hot food at very reasonable prices. Sky TV is shown throughout on a number of large screens. Contact Alex for further details. To join our club instantly online just click on the Membership link and download & complete our Lions club membership form. We hope to welcome you as a new member of our club very soon.